Escuche historias espeluznantes sobre Venecia en un tour de 2 horas por las calles y canales de Castello y Cannaregio. Descubrirás jardines ocultos, iglesias de milagros y casas de asesinos con tu guía, quien revela los secretos del pasado en este tour nocturno. Dirigido por un guía local. Haga su propia manera de reunirse con su guía en Campo San Bartolomeo a las 8 pm. 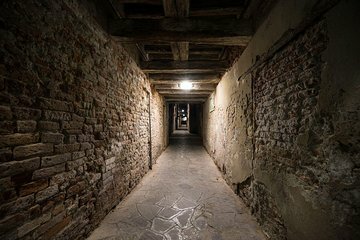 Escuche las leyendas de Venecia, junto con historias de fantasmas que perduran en la imaginación veneciana. Aprende sobre los dogos y otros ciudadanos notables, y también sobre los cuentos de la gente común. Su recorrido termina con el regreso a su punto de partida después de dos horas de cuentos de hormigueo. Would have enjoyed a guide with better story telling abilities and more stories. There seemed to be a lot of challanges with tour guides the night we took this tour. Our guide kept getting calls from other guides and our tour was disrupted numerous times. Then another group of tourists had to join our group part way through the tour. Given the size of the group, our guide had a hard time speaking to everyone which meant that only part of the group could hear what she was saying. While this was not any fault of the specific guide we had - it was very disappointing. Hopefully this was a one time occurance. Our guide was nice and walking around Venice at night, and not getting lost, was great. But the legends a bit of a stretch and your was not 2 hours, but 1 1/2 hours.